What really helped me with the itinerary was the below map that I found in Google Images of the park and various entrances and attractions. This itinerary covers the major points of interests with at least 2 miles of walking in a day. However, for more adventure and hiking the lesser known spots, you need more time and I definitely wished I had. Yellowstone National Park spans an area of approximately 3,400 sq miles comprising of lakes, rivers, and mountains ranges. Half of the world’s geothermal features are here in this Park fueled by the underground volcanic activity which is why I was referring to this place as ticking time bomb. The Park is also famous for unique species of plants, microorganisms, animals, and birds. Popular suggestion is that we do a loop but it is okay if you do go back and forth as sometimes you may discover an attraction that you may have missed. And, it is really not a bad drive provided you are able to go past the slow drivers at the passing zones. We could not do a loop because we booked this trip in the last minute and being the Memorial Day weekend, all the lodges inside the park were full. But I am glad we did not book inside the Lodge because although the food is not bad, it may be boring to pick from the same options morning and night, especially if you are a vegetarian. Day 1: We flew into Salt Lake City and drove to West Yellowstone, MT. It was a long drive (nearly 5 hours). We had booked Explorer Cabins for the first 2 nights, close to all the restaurants in the area. The accommodation was new with basic kitchen amenities. The restaurants in the area offer a lot of options apart from pizza, Chinese or a grill. We loved the Cafe Madriz, Spanish for its Tapas, Paella and even Ratatouille. Madison Crossing Lounge, a contemporary and eclectic restaurant was another one that we liked. First day was just travel, hotel check-in, dinner and sleep. Day 2: We were up early and drove to Yellowstone National Park West Entrance which was only about 15 minutes from the hotel and continued to Madison Junction, a total of 14 miles. What we did not expect is a traffic back-up for almost 40 minutes and it was not because of accident or anything else but it was a herd of Bison. 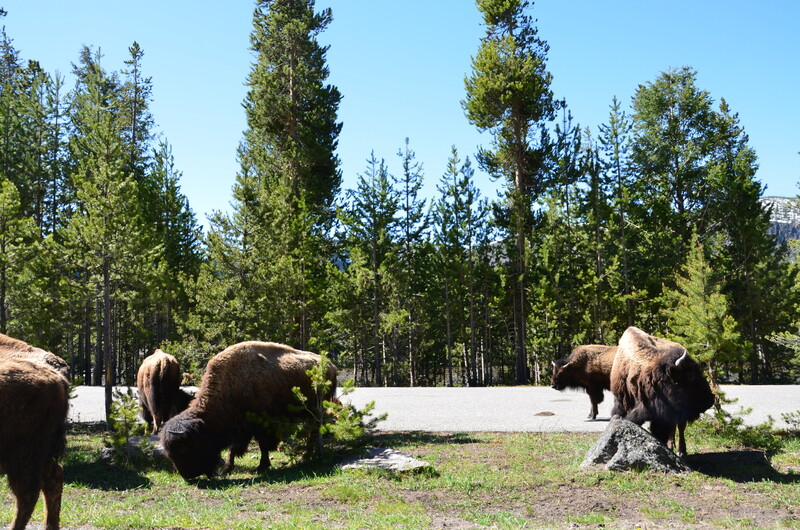 Welcome to Yellowstone! 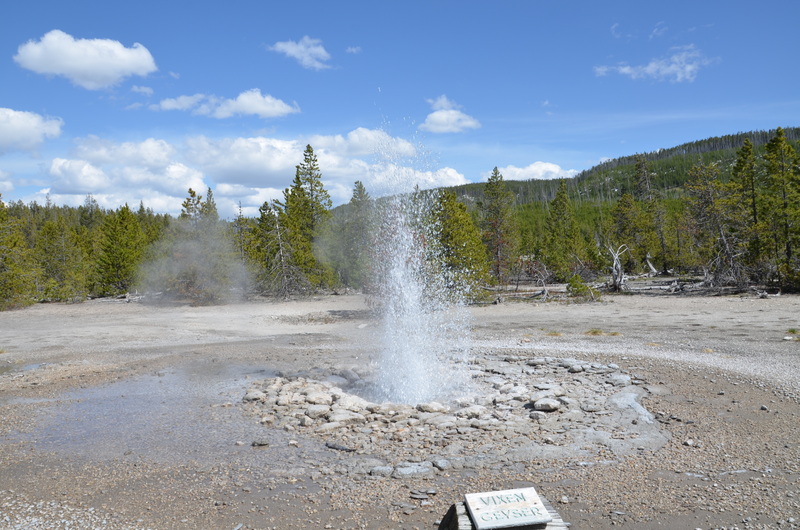 On our first day at the Park, we took a right at the Madison Junction and explored the Geyser Basin, Old Faithful and West Thumb. First stop was at the Firehole Falls at the confluence of Firehole and Gibbon Rivers. Its a small waterfall with a nice view. We then stopped at the Fountain Paint Pot Geyser area and thus began our tour of the various geysers, hot springs, mud pots, fumaroles and vents and of course, the pungent smell of rotten egg from the sulfuric acid. It took me back to my Chemistry lab days in school. How does each of these geothermal features differ from one another? Well, Geysers are Hot Springs that erupt, the super heater water below the ground become trapped in channels building the pressure. 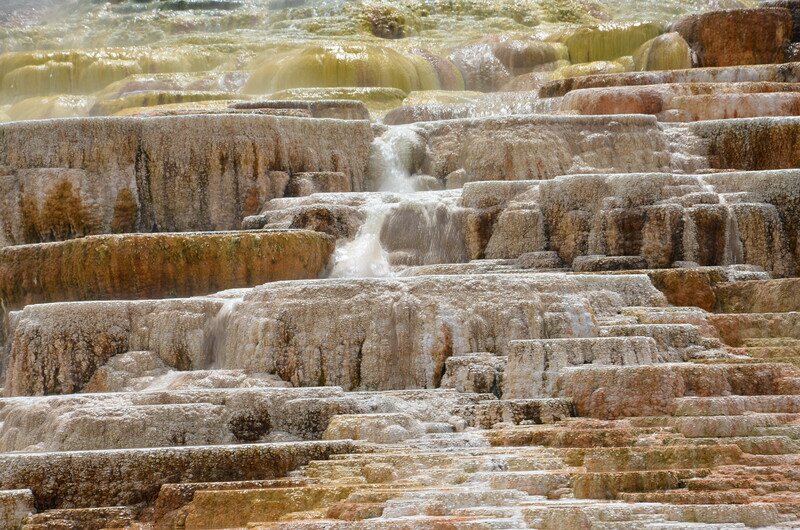 Hot Springs are vast with no blockage so there is water circulation. 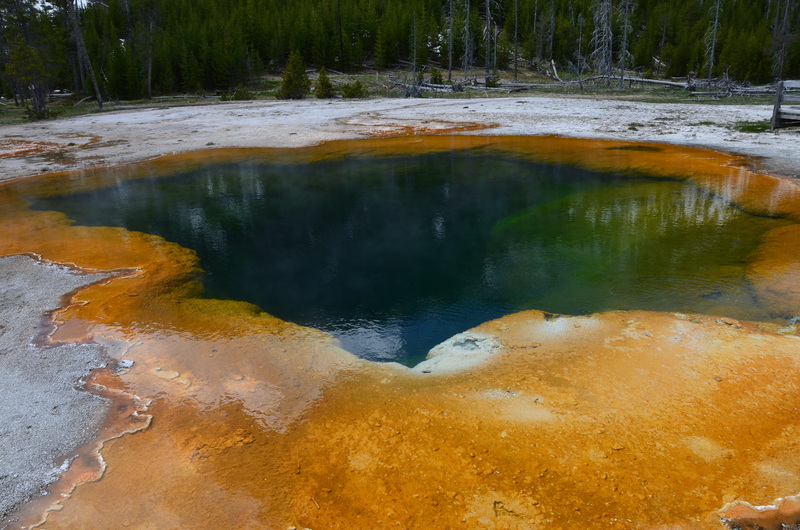 The trillions of microorganisms around this area makes hot springs extremely colorful. 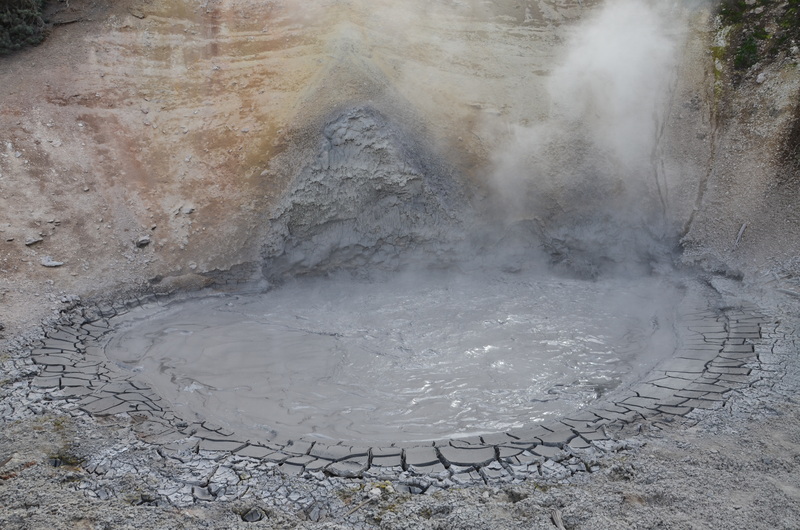 Mud Pots are water saturated sediment which is clay-like with steam rising up making it bubble and even burst. Fumaroles don’t have water but only steam from underground that escapes out with a hissing noise. Steam Vents are similar to Fumaroles but they are just cracks on the ground with hot steam escaping out. The surprising thing for me were the colors like turquoise, emerald and coral around these hot springs. I had seen a lot of pictures while researching and didn’t think much of it but itis real. 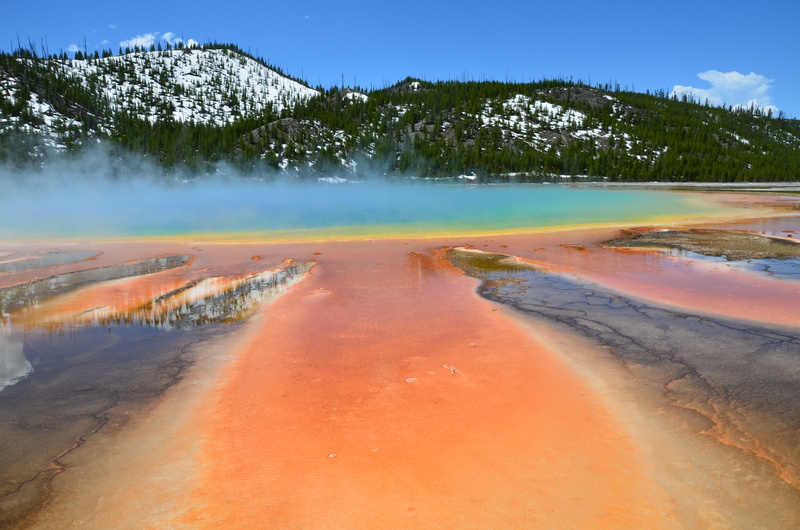 Colors are mostly because of the heat-loving bacteria called thermophiles that thrive well and create a bacteria mat around the hot springs. Most spectacular sight at the Fountain Paint Pot GB is the Red Spouter. Our next stop was Midway Geyser Basin. 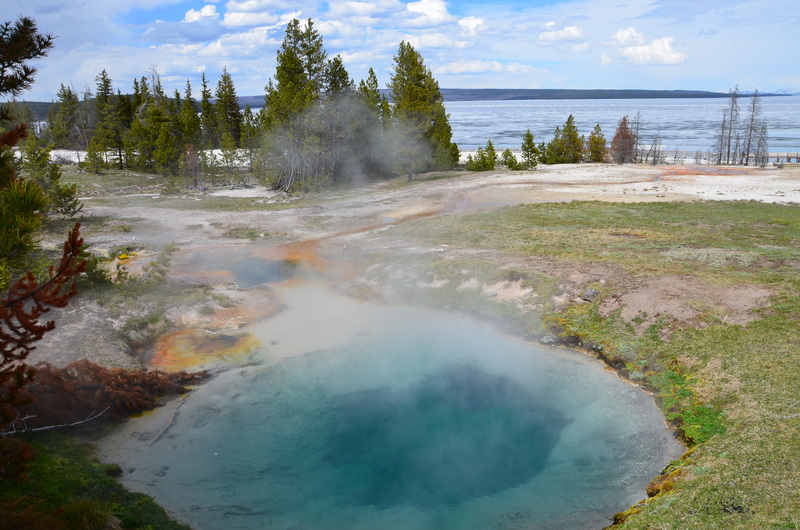 The 2 most important sights to see here are the Excelsior Geyser, the third largest in the world and the Grand Prismatic Spring, largest hot spring in the Park, second in the world. 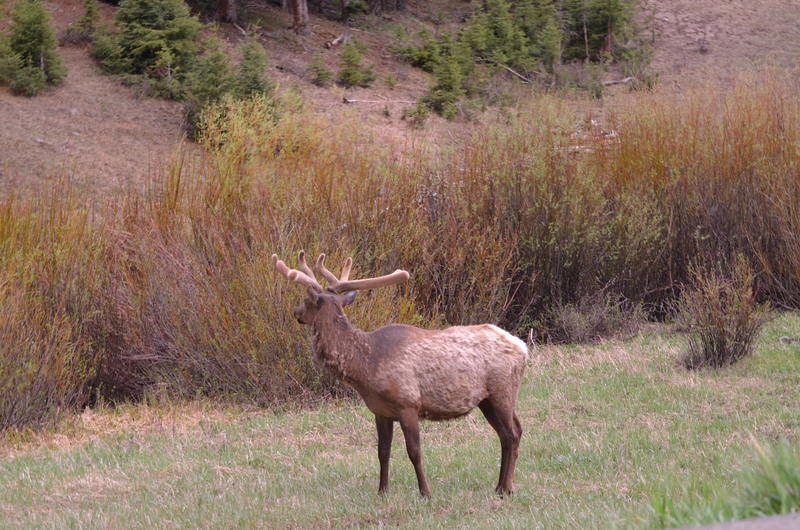 They are the most beautiful sights of the park with colors that captivate you. 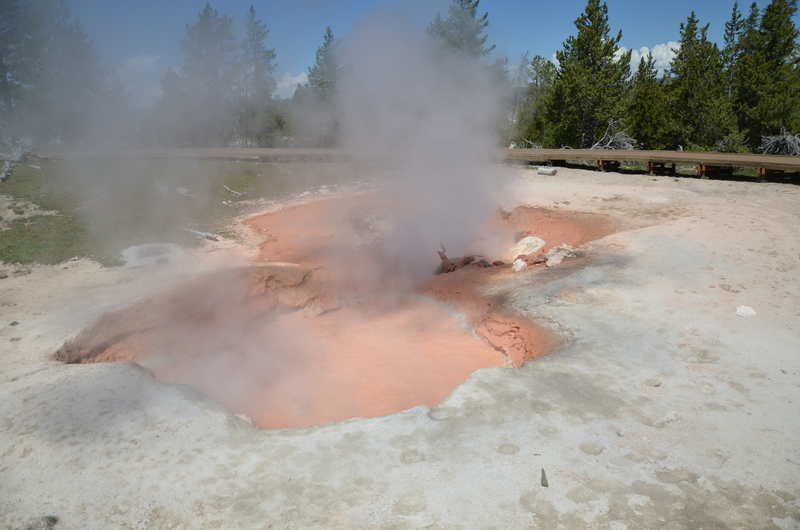 Unfortunately Yellowstone geysers and springs are not for soaking because they are super-heated above boiling point to nearly 200 °F and more. They are continuously hissing and bubbling which is why there are boardwalks around these thermal features and there are signs warning us to not walk off of the boardwalk. This is because the area is unstable and a new thermal feature can erupt at any time. Our third stop was Black Sand Basin. The most important sights to watch here are the Cliff Geyser where we were able to see the different stages of eruption, the Emerald Pool and the Opalescent Pool. A good stop for lunch is at the Old Faithful. 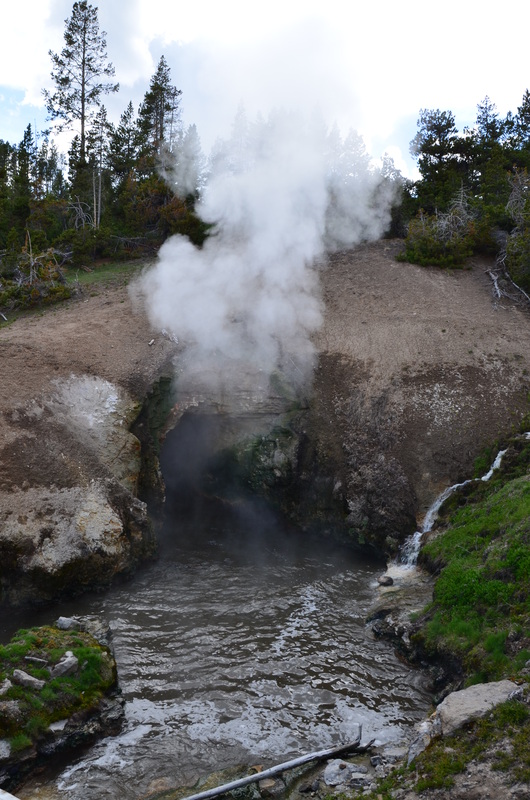 You can call at 307/344-2751 and press “1“ for continually update of eruption forecasts to see this active geyser. Old Faithful is a popular spot but actually it is quite boring when compared to other thermal areas. 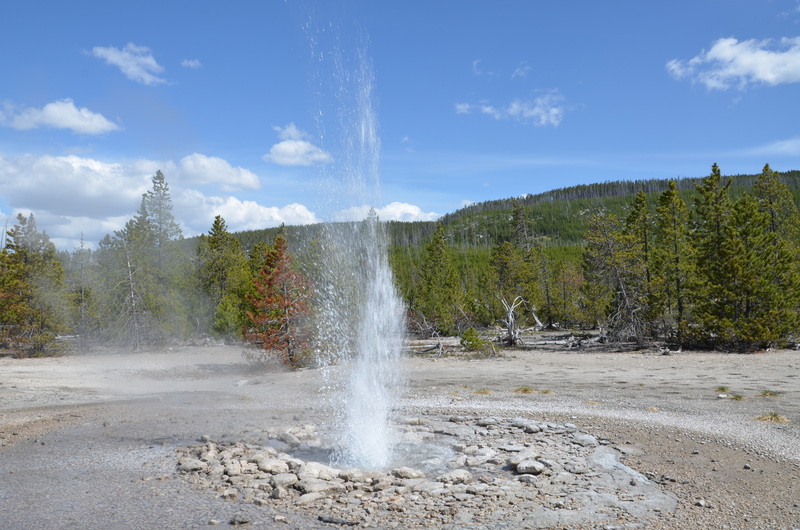 The geyser just erupts quite high, lasts about 2-3 minutes and stops. Post lunch, we drove to the West Thumb GB which is about 17 miles. 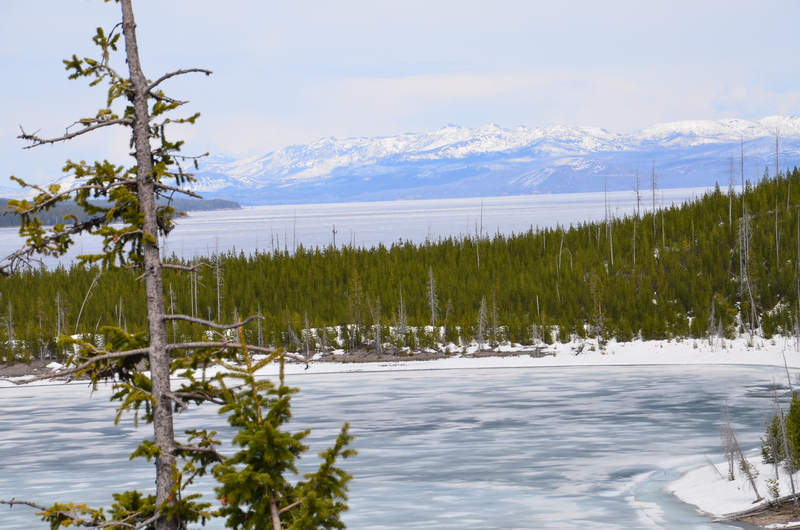 The juxtaposition of the vast frozen Lake Yellowstone against the boiling hot springs was a visual marvel. After having covered a lot on this day, we decided to go towards the South entrance and drive through Grand Teton for a while before heading back. The landscape completely changes to snow as we go higher in altitude. The peaceful Lake Jackson against the backdrop of the Rockies was quite relaxing. If you have time, there is lots to explore in Grand Teton but it was already 6 pm so we headed back to West Yellowstone. 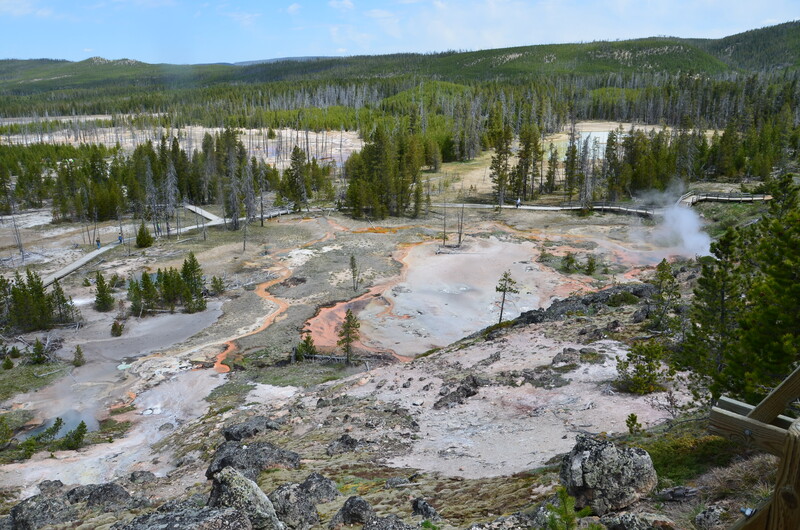 As I had mentioned earlier, we stumbled upon Lower Geyser Basin on our way back which we had missed earlier. The main attraction there that was unique to see was the White Dome Geyser. Day 3: We woke up early again and started our drive back to Madison Junction and thankfully there were no Bison to stop us that day. We went left at the Madison Junction and turned into the Grand Loop Road. We stopped at the Gibbon Falls which is an 84 feet falls in the Northwestern Yellowstone Park on the Grand Loop Road. The weather was beautiful and even felt chilly at times. In fact, it even started raining at the Canyon. So, you know why one has to dress in layers. Our next stop was at the Artists Paint Pot where you can see the mud pots, fumaroles, and vents. This is less crowded and offers spectacular views. We finally reached Canyon Village and our first stop was to go see the Lower Falls. 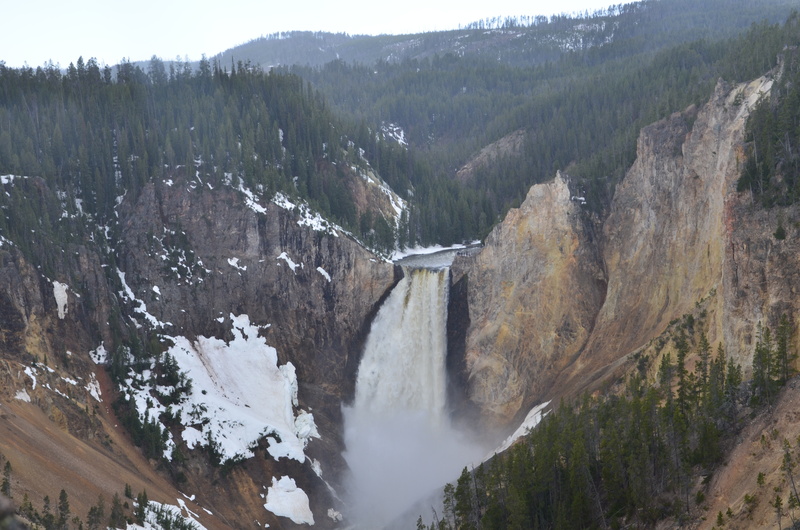 Lower Falls is the biggest waterfall in Yellowstone at 308 ft. The trail to the top of the Falls is definitely a must as it offers breathtaking view of the Yellow Falls and the beautiful Yellow Canyon. The trail is ¾ mile roundtrip bit is steep. 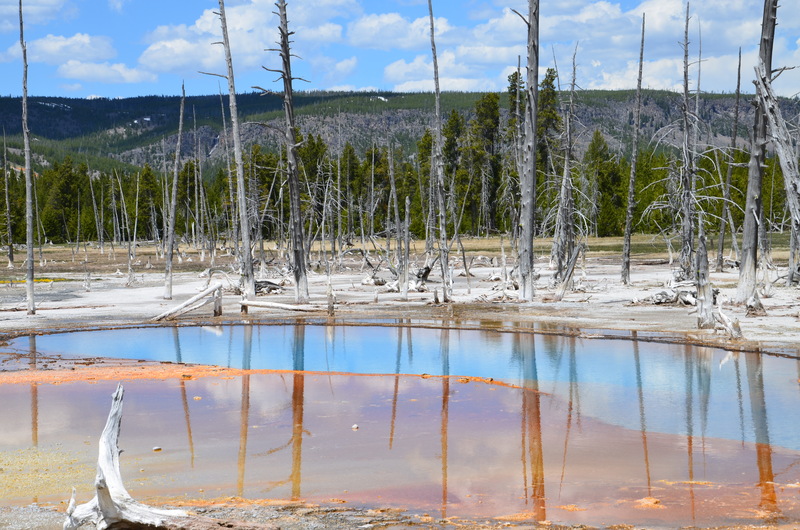 The color is because of the hot water acting on volcanic rock, Yellowstone Caldera. This is the largest and active supervolcano in the US. After working up a good appetite, we went to the Canyon Village for lunch spot and then headed to Lookout Point and Artists Point to enjoy the view of the Upper Falls, Lower Falls, the Canyon and the North Rim. 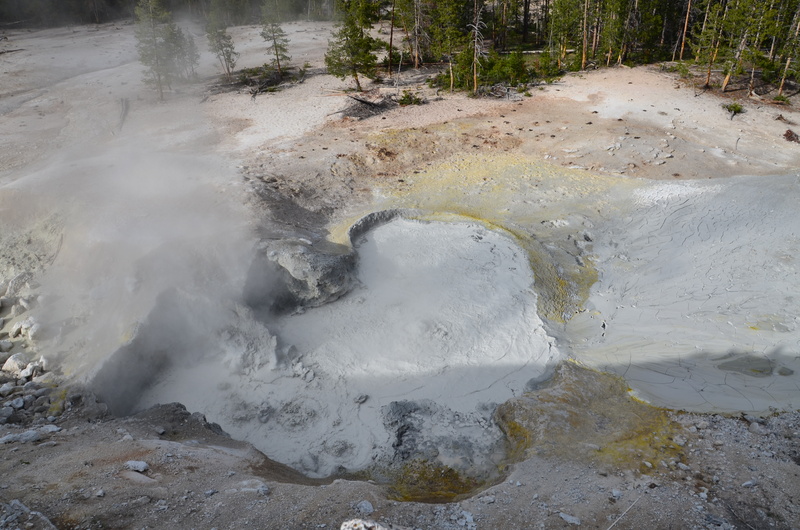 We then drove towards East Yellowstone entrance to see the Mud Volcano Area famous for the sulfuric acid ponds. Some attractions here include Mud Caldron, Dragon’s Mouth Spring, and Sulphur Caldron. We then turned around and drove for about 26 miles towards Gardiner MT, exiting Yellowstone via the North entrance. It was a beautiful drive and we did it at around 5:30 pm and we saw some wildlife on the way. First was a bear dining on some twigs. We parked our car and joined the people standing. It was safe as the forest ranger was around making sure that everyone keeps a safe distance from the bear. 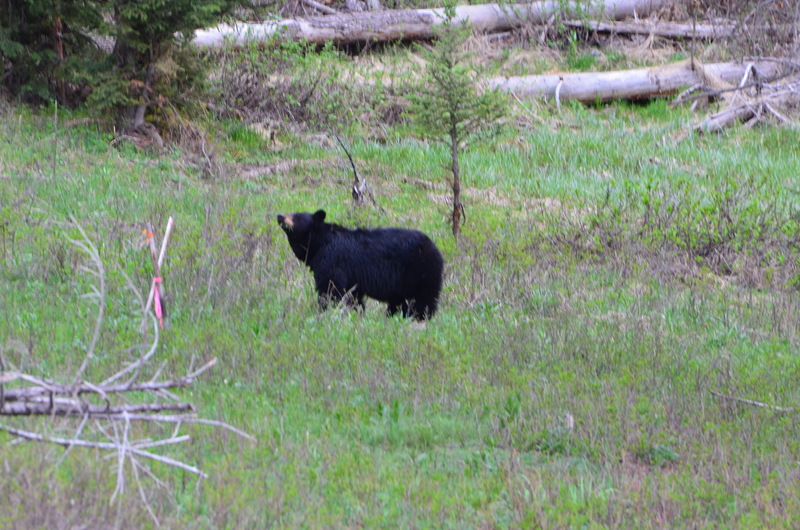 We spent about 30 minutes looking at the bear until it finished its dinner and went into the forest, quite satiated. I really wanted to see a grizzly and I was so happy to have seen one. 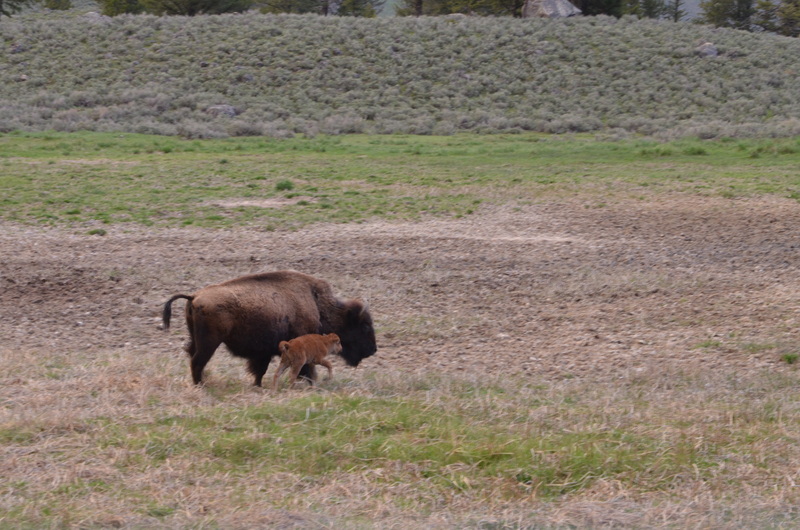 As we continued on, we were stopped by elks and a family of bison crossing the road. After a long day, it was blissful to come to a nice, clean bed. Day 4: This was our last day at the Park and since we had covered a great deal of the Park already, we took it easy on Sunday. 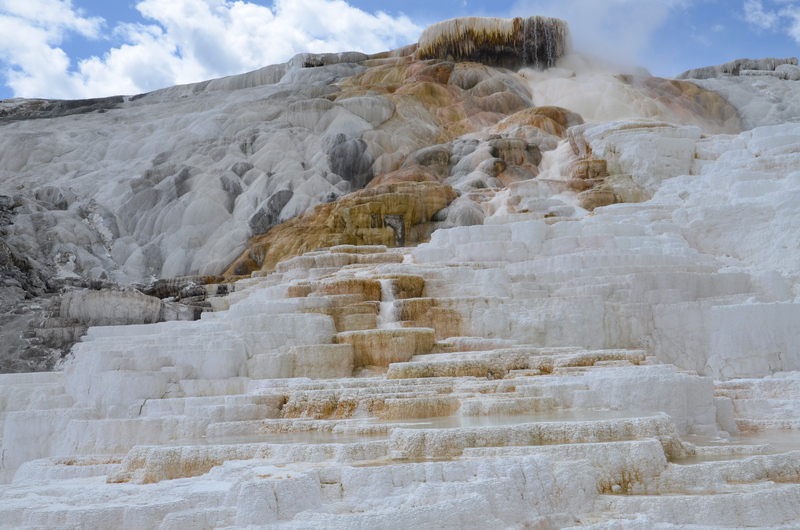 After a leisurely breakfast, we started at around noon to the Park and our first stop was Mammoth Hot Springs and the famous travertine terraces. This is a unique geothermal attraction with limestone formations. Mammoth Springs area is great for accommodation and food so you can definitely plan on staying here if you book in advance. Be sure to indulge in some amazing huckleberry ice cream! Our second stop on the way back to the Madison Junction was the Norris Geyser Basin. 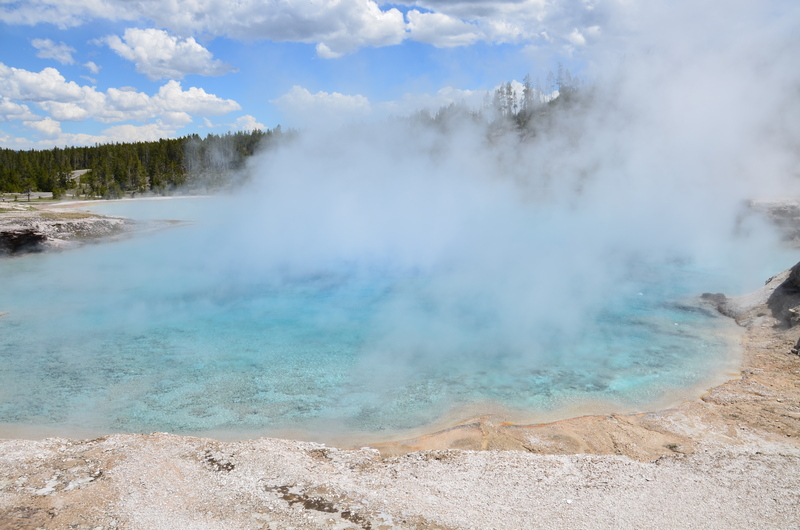 This is the most fascinating and hottest Geyser Basin with lots of geothermal activity. But be prepared for a long hike and a strong pungent rotten egg smell. I really thought I will not be able to eat eggs in my life again but trust me, you will survive. Attractions here are the Steamboat Geyser that produces world’s highest eruptions. Then there is Echinus Geyser, Vixen Geyser which was amazing to watch the different stages of the eruption and so many more. We covered both the Black Basin and the Porcelain Basin. This is it. We basically covered all that we wanted to see in the last 3 days and our plan was to say goodbye to Yellowstone and drive to Idaho Falls for the night. This was to cut short or drive the next day back to Salt Lake City for our flight back home. It was a great choice as we could unwind ourselves here in this quaint city. We stayed by the Snake River Belt. Ou room had a balcony with the view of the River. We got some food and just relaxed our tired feet gazing at the river and people walking/jogging. It felt great to be back into civilization. Day 5: Well, we requested a late check-out as our flight was later that night so we had a scrumptious breakfast (I actually had a French Toast in spite of being some what sick of the rotten egg smell!) and took a leisurely stroll along the Snake River and the Idaho Falls created by a hydroelectric power project. Well, we then checked out of our hotel and drove back to Salt Lake City and flew back home. All good things come to an end and it’s always awesome to come back home. 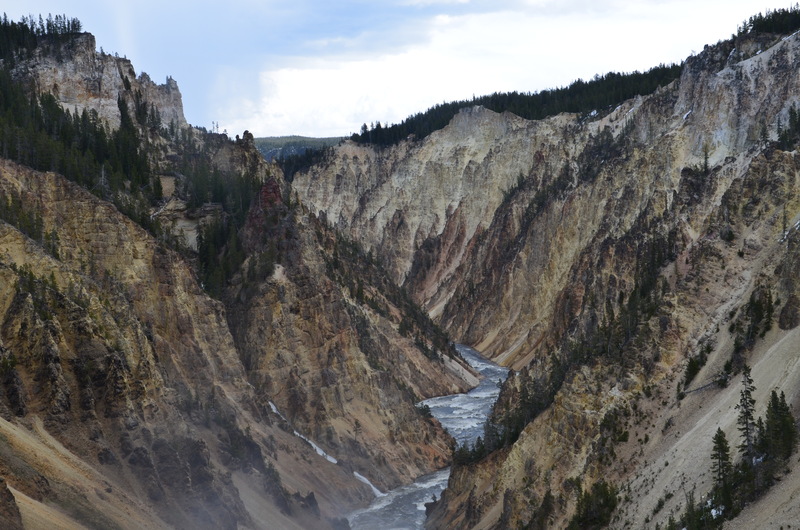 Hope this will help you to create your itinerary to Yellowstone some day.